I hope everyone had a good Easter! My Easter weekend was a bit stressful, and I went to the skin doctor to find out why little red spots keeping popping up all over my arms, back and sides…. apparently it's a common viral infection that will heal itself over a few months. At least it's nothing serious! Time for another product review, and a giveaway – Happy Easter! 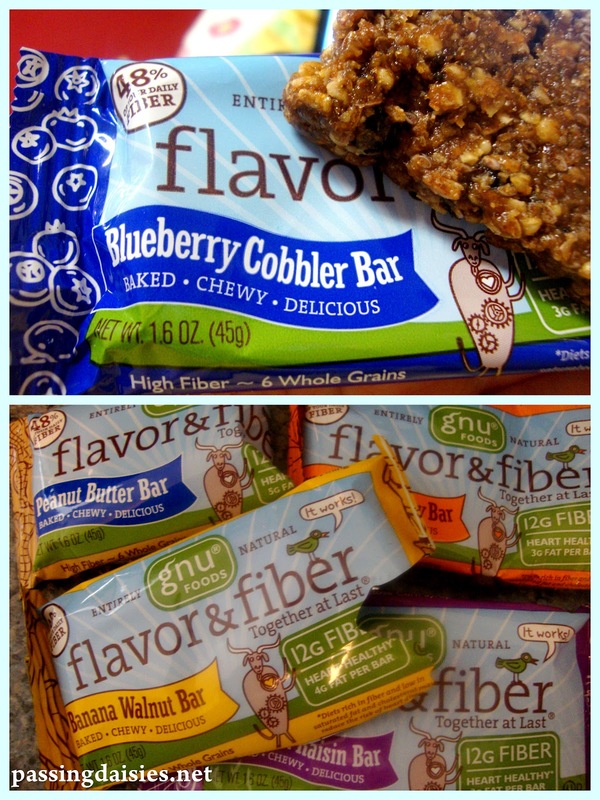 A little while ago, the kind people at GNU Foods agreed to send me a box of 8 of their 10 bars, with 2 of each flavor. They also sent me another of the exact same box to giveaway to one lucky reader – keep reading to find out how to win! I really love GNU bars because they all weigh in at around 130-140 calories per bar, but each bar is still filling and full of fiber. They also don’t use a lot of added sugars, which I really liked. As mentioned earlier, they sent me 8 flavors to review: Carrot Cake, Cinnamon Raisin, Blondie, Orange Cranberry, Chocolate Brownie, Blueberry Cobbler, Peanut Butter, and Banana Walnut. Three of these flavors are new – the blueberry cobbler, blondie, and carrot cake bars. I found all of these to be delicious, but the blueberry cobbler was bar far my favorite! It was the first bar I tried out of the package I was sent and I liked it the best. It definitely tasted like a blueberry muffin – so yummy. It had all the components of a blueberry cobbler - blueberries, lemon juice, and oats 0 and big pieces of visible blueberries. The blondie, although I don’t eat many blondies, tasted like what I imagine a blondie to taste like. And I always love carrot cake - this was a great alternative to its more fattening cake cousin! All the other bars were delicious, and tasted much like their names. A close second to blueberry was the orange cranberry. I loved the strong flavors present in this bar! MANDATORY - tell me which GNU bar you most want to try and why. Giveaway ends on April 15th at midnight. I "like" Gnu Foods on facebook + am following them on twitter! I "like" Passing Daisies + follow you on twitter! I would LOVE to try Espresso Chip! I definitely think blueberry would be my favorite...just such a yummy flavor. The Blondie flavor would be my choice! Like GNU on Twitter AND Facebook. Like you on Facebook AND follow on Twitter. All of them sound great but the blueberry cobbler sounds like an especially good treat! And I subscribed via email (floptimism@yahoo.com)! Blueberry Cobbler bars sound great as I love Blueberry Pie! i would love to try the blueberry cobbler bar! My choice would be either the carrot cake or blueberry cobbler - seems that blueberry cobbler has gotten the most votes so it must be a winner - would love to try Thanks! And just subscribed - thanks for a wonderful yummy giveaway! Blueberry Cobbler all the way!!! Sounds delicious!!! I "Like" Gnu foods on Facebook! I am subscribed to PD emails! I would just love to try the blondie kind!! I would LOVE to try the Chocolate Brownie bar because I LOVE chocolate and I LOVE Brownies!!! Now that's a perfectly delicious combination! CARROT CAKE! omg, sounds so delish! That is my favorite type of cake! I'd love to try blueberry cobbler! I follow Gnu Foods on twitter and facebook!